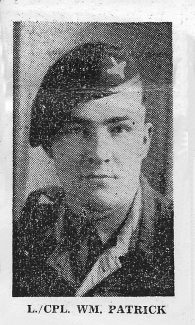 Back in 2014 I posted an article on the site in-respect of Private Arthur Judge who was killed at the battle of Imjin River in Korea in 1951. I have now come across a Langdon Hills man who also took part with the ‘Glorious Gloucesters’ at the battle but unlike Arthur he appears to have survived although he was captured by the Chinese. ‘Mr W. A. Patrick picked up a letter from the door-mat at his home, “The Homestead” Butler’s Grove, Langdon Hills. The envelope bore the post mark, “Peking, China” and it contained the news for which he had been waiting anxiously for past five months. The letter told him that his 24 year-old son, L/Cpl. William Patrick one of the “Glorious Gloucester”, who was reported missing after he had fought with his gallant regiment in the desperate battle of the Imjin River in Korean, was safe. It was written by his son a prisoner in Communist China – and said he was well. A few months after William was demobbed from the Army – he served with the Airborne Regiment in Palestine – the war in Korea broke out and William volunteered. He joined the Gloucester Regiment and went to Korea. The question now is, does anybody remember the family and what happen to William, did he get home safely?